TREES Inc., along with the nonprofit group Southern Indiana Cooperative Invasives Management (SICIM), are leading the formation of local partnerships to address invasive species and they need your help. 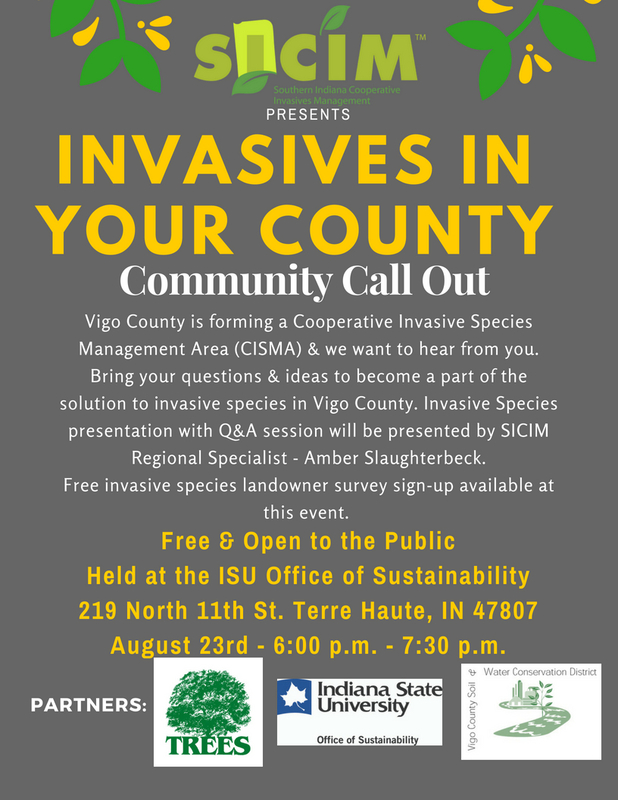 Join us for our “Community Call Out”, August 23rd, 6:00 p.m. - 7:30 p.m. at the Indiana State University Office of Sustainability to form our Cooperative Invasive Species Management Area (CISMA). Invasive species can include plants such as the infamous Kudzu, known as the vine that “ate the south.” They can also refer to animals/insects, think of the Emerald Ash Borer, a small insect from Asia that has spread across much of the Midwest, killing millions of native ash trees. In fact, there are many different invasives in Indiana that spread and cause serious economic, environmental, and health impacts. Poison Hemlock, an invasive noxious weed commonly seen along roadsides and fencerows, is highly toxic to humans and livestock. Many invasive shrubs, such as Burning Bush and Autumn Olive, were and sometimes still are planted as landscaping or for wildlife. Unfortunately, they create a dense shrub layer in woodlands and interfere with the growth of native plants, including new tree seedlings. While private and public landowners have managed invasives for years, according to SICIM, one of the best ways to address the threat of invasive species is through local Cooperative Invasive Species Management Areas or CISMAs. Among other things, these grassroots partnerships help to raise awareness of local invasive concerns, bridge the gap between management of invasives on public/private lands, and help address emerging invasive threats. To support CISMAs, SICIM has partnered with NRCS to hire regional specialists around the state as part of the “Indiana Invasives Initiative” (more info at http://www.sicim.info/cisma-project/). “In Vigo County, we are seeking community input and participation to combat invasive species at the grassroots level. I hope to see every Vigo County resident participate in the formation of our CISMA,” says Regional Specialist, Amber Slaughterbeck. For more information, contact Amber Slaughterbeck at Amber@SICIM.info or 812-229-3539. Comment NOW on Indiana Terrestrial Invasive Plant Rule!